Defensins (alpha and beta) are cationic peptides with a broad spectrum of antimicrobial activity that comprise an important arm of the innate immune system. The alpha-defensins are distinguished from the beta-defensins by the pairing of their three disulfide bonds. To date, four human beta-defensins have been identified; BD-1, BD-2, BD-3 and BD-4. 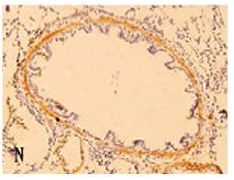 Beta-defensins are expressed on some leukocytes and at epithelial surfaces. In addition to their direct antimicrobial activities, they are chemoattractant towards immature dendritic cells and memory T cells. The Beta-defensin proteins are expressed as the C-terminal portion of precursors and are released by proteolytic cleavage of a signal sequence and, in the case of BD-1 (36 a.a.), a propeptide region. Beta-defensins contain a six-cysteine motif that forms three intra-molecular disulfide bonds. Beta-Defensins are 3-5 kDa peptides ranging in size from 33-47 amino acid residues. DEFB103A MaxPab polyclonal antibody. Western Blot analysis of DEFB103A expression in human colon. Western Blot analysis of DEFB103A expression in transfected 293T cell line (H00055894-T02) by DEFB103A MaxPab polyclonal antibody.Lane1:DEFB103A transfected lysate(7.37 KDa).Lane2:Non-transfected lysate. To detect hBD-3 by sandwich ELISA (using 100 ul/well antibody solution) a concentration of 0.5 - 2.0 ug/ml of this antibody is required. This antigen affinity purified antibody, in conjunction with Biotinylated Anti-Human BD-3 as a detection antibody, allows the detection of at least 0.2 - 0.4 ng/well of recombinant hBD-3. Purified recombinant protein of Human defensin, beta 103A (DEFB103A).